BACKGROUND AND PURPOSE: There is a lack of normative diffusion tensor imaging (DTI) and 3D MR spectroscopy (MRS) data in the early neonatal period. We report quantitative values from a cohort of healthy term neonates to serve as baseline data for studies assessing brain development and injury. MATERIALS AND METHODS: Sixteen healthy term neonates (median age, 7 days) were studied with spin-echo T1- and T2-weighted MR imaging, DTI, and 3D point-resolved spectroscopy sequence (PRESS) MRS without sedation on a 1.5T scanner. Average diffusivity (Dav), fractional anisotropy (FA), eigenvalues (EV), and metabolite ratios (N-acetylaspartate [NAA]/choline, lactate/choline) were calculated by automated processing in 7 brain regions. Neurodevelopment was assessed by blinded and validated neuromotor examinations and the Bayley II test at 3 and 14 months. RESULTS: Two neonates were excluded from the cohort: one had brain injury on T2-weighted imaging, and the other, who had normal MR imaging, showed mildly delayed cognition at 14 months. The mean DTI values of the remaining 14 neonates were between these ranges: Dav=0.98–1.48 10−3 mm2/s, FA=0.14–0.30, EV1=1.21–1.88, EV2=0.95–1.46, and EV3=0.77–1.24 (all × 10−3 mm2/s). The NAA/choline ratio ranged between 0.58 and 0.73, and minimal lactate/choline (<0.15) could be detected in each neonate. All neonates exhibited clinically normal neuromotor status. CONCLUSIONS: Our study demonstrates the feasibility of obtaining high-quality quantifiable MR data in nonsedated healthy term neonates that can be used to study normal early brain development and as control data in studies of perinatal brain injury. A major limitation of previous studies has been the lack of normative DTI and MR spectroscopy data in healthy term neonates. Past studies have used encephalopathic neonates with eventual normal outcome as surrogates for the control group for comparison. To address the need for normative DTI and MR spectroscopy data, we prospectively recruited a cohort of healthy term neonates to serve as a control group for studies assessing brain injury in term-born neonates. In this study, we report the findings of the anatomic MR imaging, DTI, and 3D MR spectroscopy in this control group to serve as baseline data for future studies. Sixteen healthy term neonates were prospectively enrolled and studied with MR imaging between July 2004 and October 2005 at our institution after parental informed written consent had been obtained. Our Institutional Review Board approved the research protocol. Fifteen neonates were born at our institution, and all were admitted to the hospital's Well-Baby Nursery after delivery. Neonates with any of the following signs of perinatal depression were excluded: umbilical artery pH less than 7.1, base deficit greater than −10, a 5-minute Apgar score of 5 or less, and seizures or muscle hypotonia beyond resuscitation. Neonates younger than 36 gestational weeks and those with suspected or confirmed metabolic disorder, congenital infection, or malformation were excluded. All neonates had normal findings on neonatal examination by the attending pediatrician on admission and showed no clinical signs of encephalopathy during the neonatal period. Labor, delivery, and neonatal charts were reviewed for birth events, and the amount of resuscitation required at birth scored as: 0, no intervention; 1, blow-by oxygen; 2, endotracheal suctioning only; 3, bag-mask positive pressure ventilation; 4, endotracheal intubation with positive pressure ventilation; and 5, endotracheal intubation with positive pressure ventilation and medication. All neonates underwent MR imaging without pharmacologic sedation in an MR-compatible incubator with a neonatal head coil on median day 7 after birth (range, 1–13 days) without adverse events. During the hospitalization period, the MR studies were performed as soon as scanner time and personnel to accompany the neonate to the scanner were available. If neonates were studied after discharge, the MR imaging was performed when the parents and the scanner time were available. All studies were performed with a custom-built MR-compatible neonatal incubator and a high-sensitivity specialized neonatal head coil built as prototypes in conjunction with General Electric Corporate Research & Development (Schenectady, NY) to reduce patient motion, increase patient safety and comfort, and improve signal-to-noise ratio (SNR) of the MR images.18 Infants were scanned without sedation immediately after being fed; neonatologists monitored the infants during scanning. The MR examination was performed on a 1.5T Signa EchoSpeed scanner (GE Healthcare, Milwaukee, Wis). The anatomic MR imaging consisted of axial T2-weighted dual spin-echo (TR, 3000 ms; TE, 60/120 ms; 4-mm section thickness), and axial T1-weighted spin-echo (TR, 500 ms; TE, 11 ms; 4-mm section thickness) with an 18-cm FOV and a 192 × 256 acquisition matrix. Two experienced neonatal neuroradiologists assessed each scan separately for the presence and location of any signal intensity abnormalities and scored them using a previously validated MR imaging scoring system.8 Consensus was reached on all findings with an overall κ value of 0.9. For the 3D MR spectroscopic imaging (MRS), the point-resolved spectroscopy sequence (PRESS) was used to excite a selected region with further localization by 3D chemical shift imaging (CSI) as described previously.12 The PRESS selected volume included a region of approximately 100–200 mL, which encompassed most of the neonate brain but excluded the spatial inclusion of subcutaneous lipids. Phase encoding in the PRESS-CSI sequence was used to obtain 8 × 8 × 8 3D spectral arrays with a nominal spatial resolution of 1 mL. After a 2–3-minute prescan procedure, including autoshimming, we acquired 3D PRESS MRSI (with very selective saturation [VSS] pulses to provide improved coverage and excitation profiles) in a 17-minute acquisition. A lactate-editing MRS scheme was used to provide the detection of lactate independent from lipid signals in addition to NAA, choline, and creatine.25 The MR images and raw MRS data were transferred off-line to an UltraSparc workstation (Sun Microsystems) for analysis with the use of custom software developed at our institution for 3D MRS processing. Spectral processing included 4D Fourier transformations, automatic frequency and phase adjustments, baseline fitting, and peak integration for the choline, creatine, N-acetylaspartate (NAA), lipid, and lactate resonances. This software also provided postprocessing alignment of the spatial center of the spectral arrays. This was used to center the MRS data to the PRESS-selected regions and to position 1-cm3 spectral voxels in specific anatomic locations as defined from the MR images by using a custom-designed region of interest tool. The region of interest and MRS display tools were written in the Interactive Display Language (IDL; Research Systems, Boulder, Colo). To define voxels within the selected regions (and not in the saturation bands surrounding the selected volume) and with adequate signal intensity-to-noise (SNR peak height/noise height), we calculated the noise and SNR for each voxel and metabolite. We also calculated the peak area ratios of lactate/choline and NAA/choline for each voxel. To avoid spuriously large metabolite ratios, ratios were reported only for voxels with a choline SNR greater than 5. In 2 patients (16 and 10), data were corrupted by motion artifact, and the ratios could not be calculated. Locations of regions of interest for MRS and DTI measurements are marked by rectangles as follows:) basal ganglia (1), thalami (2), calcarine cortex (3), optic radiations (4), corticospinal tracts (5), posterior white matter (6), frontal white matter (7). 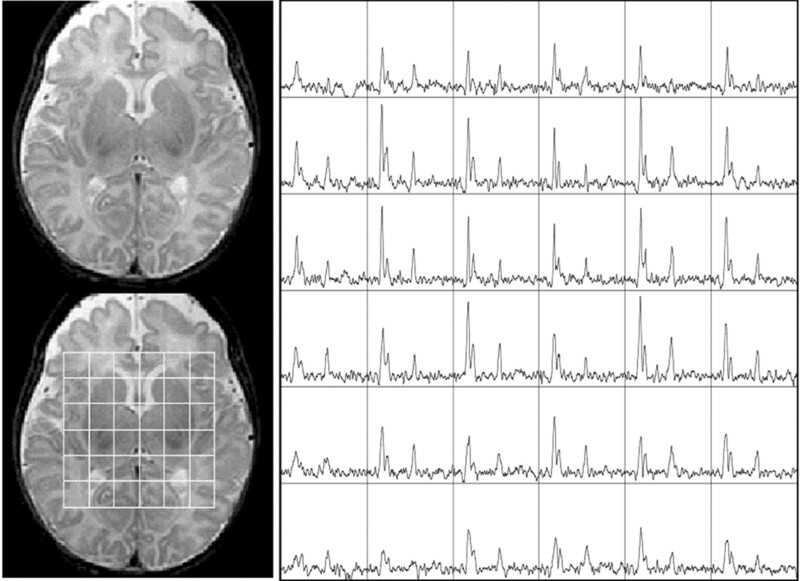 A, Squares showing region of interest locations from which proton spectra ratios were acquired and calculated by automated processing after the MR study of every neonate. B, Squares showing the regions of interest from which Dav, FA, and eigenvalues were calculated by automated processing. 3D MR spectroscopy imaging on a single plane at the level of the basal ganglia illustrates the variation in maturity of metabolites in different regions of a healthy term neonate. Note that the thalami have the most mature spectra, with lowest choline and highest NAA peaks, and the frontal white matter has the least mature spectra. Neuromotor outcome was assessed for all age-eligible neonates at 3 and 14 months of age by pediatric neurologists blinded to the neonatal course and MR imaging findings. A validated neuromotor score (NMS) was assigned at each standardized neurologic examination: 0, normal; 1, abnormal tone or reflexes; 2, abnormal tone and reflexes; 3, functional deficit of power in addition to tone or reflex abnormality; 4, cranial nerve involvement with motor abnormality; 5, spastic quadriparesis.26 Mental development at 14 months of age was assessed by a developmental psychologist on the Bayley Scales of Infant Development—2nd Edition, yielding a Mental Development Index (MDI) without knowledge of the neonatal course and the MR imaging findings.27 The average score for the MDI was set at 100, with an SD of 15. Scores less than 85 (−1 SD) suggested mildly delayed performance indicative of developmental risk, and scores less than 70 (−2 SD) suggested significantly delayed performance. Neurodevelopmental outcome was classified as normal if there were no motor deficits, the neuromotor score was 0–1, and the MDI was greater than or equal to 85. We used descriptive statistics to present the MR, neonatal, and outcome data. The limited sample size and the large number of predictor variables precluded a meaningful statistical analysis of the imaging characteristics and the neonates regarding the outcome of the study. The 16 neonates in the cohort included 4 girls; they were born at a median gestational age of 40 weeks (range, 39.14–41.28 weeks) with a mean birth weight of 3640 g (range, 2890–5560 g). Their mothers had a median age of 34 years (range, 26–40 years) and were gravida 2 (range 1–4), para 2 (range 1–3). The perinatal course is shown in Table 1. None of the 9 neonates born with meconium-stained amniotic fluid had meconium suctioned from below their vocal cords. Both neonates (7 and 15) with lower 1-minute Apgar scores (4 and 5) needed endotracheal intubation with positive pressure ventilation, after which their 5-minute Apgar scores normalized (9 and 9). Neonate 1 was included in our study despite the arterial cord pH of 7.08 (slightly less than our cutoff value of pH=7.1), because the neonate had no signs of fetal distress, had good Apgar scores, and showed no signs of neonatal encephalopathy. All neonates had normal findings on their neurologic examinations by the admitting attending physician in the Well-Baby Nursery. Each neonate had one MR study performed on median day 7 after birth (range, 1–13 days). Routine T1- and T2-weighted spin-echo images were normal for age in all neonates in the final cohort. The Dav, FA, and eigenvalues from the 7 brain regions sampled by the automated processing are shown in Tables 2 and 3. The metabolite ratios from the voxels sampled by automated processing of the MRSI are shown in Table 4. MRS data of 1 neonate could not be used at all due to patient motion during data acquisition. In the other neonates, good NAA data were acquired for the 3 gray matter regions and the optic radiation regions. Of the gray matter regions, the calcarine cortex had the highest NAA/choline ratio, whereas the basal ganglia had the lowest. In several neonates, no NAA/choline or lactate/choline metabolite ratios could be obtained for the other white matter regions because they were located outside of the PRESS-selected volume or had an inadequately small (<5) choline peak height/noise height ratio and were therefore excluded. It is noteworthy that minimal lactate could be measured in each neonate; the mean lactate/choline ratio for each region was less than 0.15. The neonate with mildly delayed cognition (15) at the 14-month examination had normal anatomic MR imaging on day 12 after birth with increased Dav and eigenvalues in the posterior white matter. He had increased NAA/choline ratios in the calcarine cortex, optic radiations, and frontal white matter, and increased lactate/choline levels more than 2 SD above the mean in the optic radiation. Results for patient 16 were excluded from the normal data tables because the routine MR done on day 2 after birth showed injury to the cortex (blurring of the cortex on T2-weighted images) in the vascular boundary zones (commonly called the “watershed” zones) along with hyperintensity of the subcortical white matter. It is noteworthy that this neonate had consistently increased (ie, 1 SD above the cohort's mean) Dav and eigenvalues in all regions. The 3D MRS was unsuccessful in this patient because of excessive motion during data acquisition. All neonates were assessed first at a median of 90 days after birth (range, 79–106 days), and 13 were assessed at a median of 14 months of age (range, 13–15 months). In neonate 1, the family could not return for the 14-month examination within the allocated window of time because of logistic reasons, and neonates 13 and 14 had not yet reached 14 months of age. Summary of the findings on follow-up examination is shown in Table 5. To maximize the sensitivity of the follow-up examinations, the pediatric neurologists assigned an NMS of 1 for any, even slight, changes in reflex or muscle tone. All neonates in the cohort had overall clinically normal findings on neuromotor examinations (NMS=0–1) at both follow-up time points. Three neonates (3, 4, and the excluded 16) had subtle hypertonic or hypotonic changes at 3 months of age but had completely normal muscle tone by the 14-month examination. Neonate 15 was excluded from the normal cohort because of his mild delay in cognitive development at the 14-month examination. He had hyper-reflexia at 3 months and still had the remnants of primitive reflexes at the 14-month assessment. In this prospective cohort study, we have established a data base of DTI and 3D MRS data in healthy term neonates, which can be used as a normal standard of reference for neonates with neurologic abnormalities. Others have established similar normative data bases of diffusion tensor and spectroscopic images but mainly for older neonates and for the pediatric population, not for the early neonatal age, when information gained from advanced MR techniques could be used to identify those who need early intervention the most.28,29 Our study is enhanced by the fact that all neonates were studied as volunteers and were not referred for the MR imaging for clinical reasons. However, because of this method of ascertainment, the neonates were not sedated for these research MR studies because of ethical considerations. Consequently, in some neonates, motion artifact reduced the amount of data that was successfully acquired and processed. The rigorous review of the labor, delivery, and neonatal charts; the anatomic MR images; and the standardized, validated, and blinded neurodevelopmental examinations at 2 time points ensure that only clinically normal control data are presented as normative for future studies. A surprising finding of our study was that 1 neonate (16) with a completely normal neonatal course had brain injury discovered on conventional MR imaging 2 days after birth. This injury would have remained unrecognized as part of standard clinical care, because an MR image would not have been indicated because of the lack of abnormal clinical signs in the neonatal period. We are left with the question of how clinically meaningful this incidental finding is long term, and we certainly do not propose that all neonates with normal clinical presentation undergo brain MR scanning for screening purposes. This neonate showed injury in the watershed zone, which is a common MR pattern of injury in term neonates after hypoxia-ischemia, and is associated with a less severe clinical course compared with an injury that predominantly affects the basal ganglia.30 This neonate showed increased mean diffusivity in all brain regions, including those important in cognitive functions (frontal and parietal white matter) and in motor functions (such as the basal ganglia and the corticospinal tracts). This increased diffusivity, combined with the pattern of abnormality, suggests subacute to chronic injury as the cause.7,31 This neonate showed truncal muscle hypotonia with poor head control at the 3-month examination, and normal tone, but mildly impaired cognition at the 14-month examination, supporting the imaging findings of injury. Likewise, in a pilot study, children with developmental delay demonstrated increased mean diffusivity in the white matter compared with controls.32 Neonates with watershed pattern of injury may need longer follow-up to reveal learning and behavior abnormalities, as these may emerge later in life. Furthermore, we found that even healthy neonates with normal conventional neonatal MR imaging studies might manifest subtle neuromotor findings at 3 months of age, most of which normalize by 14 months. Thus, neuromotor assessment at a very early age might not be a good surrogate marker of later neuromotor outcome. We emphasize that all children in our study have normal cognitive and motor function in their everyday lives. The subtle changes in muscle tone and reflexes that we detected as part of the standardized examinations would have been considered within the normal spectrum during a routine visit. Moreover, the Bayley Mental Development Index at this early age is reportedly not yet a strong predictor of later cognitive outcome.35,36 Three children in this cohort are raised in non-English-speaking homes: the 2 excluded children (15 and 16) with mildly impaired MDI, and one (13) who has yet to be assessed. As the Bayley test was administered in English for all neonates in the study, a child raised in a language environment other than English might have had a more difficult time following instructions even with a translator present. Our study had several limitations. Neonates enrolled in the study might differ from nonparticipating neonates due to recruitment bias. The children in our study might be more likely to exhibit subtle motor and/or cognitive delay than would the general population if other family members had developmental problems, as the parents would be more likely to enroll them in the study due to concerns about their child's future development. We also lacked the full perinatal information on 1 neonate (3), who was born in another hospital before being transferred to our facility. However, he showed normal gross and fine motor and cognitive development on the 14-month examination and, therefore, was included. To increase our sample size, we plan to continue enrolling and following new subjects. Despite these limitations, this study provides heretofore unavailable information on sophisticated MR imaging values in neonates with so-called normal early brain development, and these data will prove useful as control data for future studies of neonatal brain disorders. Equally important, it demonstrates that brain injury may remain unrecognized in clinically healthy neonates, and that healthy term neonates can later present with subtle cognitive findings, even in the absence of detectable brain injury on MR imaging. Long-term neurodevelopmental follow-up is needed to determine the clinical relevance of these findings. We thank the research nurses, Nancy Newton, RN, MS, Jill Imamura-Ching, RN, BSN, Jane Holland-Brown, RN, Julie Bushnell, RN, MS, and Jessica Ravitz-Sturm, RN, BSN, MPH, for their dedicated help and expertise. This research was supported by National Institute of Neurological Disorders and Stroke grant P50-NS35902—Program Project Grant Funding, the Doris Duke Clinical Research Fellowship, National Institutes of Health grant M01-RR01271—Pediatric Clinical Research Center, University of California at San Francisco, Calif.
Mukherjee P, McKinstry RC. Diffusion tensor imaging and tractography of human brain development. Neuroimaging Clin N Am 2006;16:19–43, vii. Accepted after revision September 22, 2006. Question 1: Is sedation necessary for MRI in an infant?